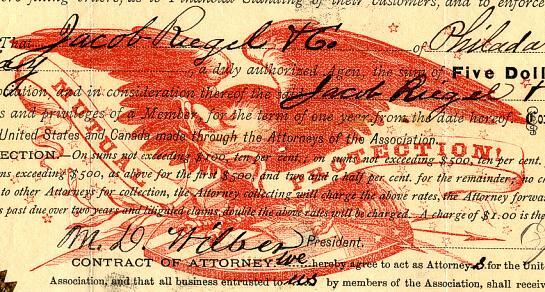 Beautiful RARE certificate from the United States Reporting & Collecting Association issued in 1878. This historic document was printed by F.C.Cramer & Company and has an ornate border around it with a vignette of an eagle. This item has the signatures of the Company's President, M. D. Wilber, Secretary. and Secretary, E. J. Wilber, Secretary. and is over 129 years old. This is the earliest collection agency certificate we have seen. U.S. 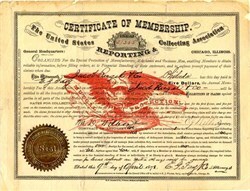 REPORTING AND COLLECTING ASSOCIATION AND MERCANTILE AGENCY. ORGANIZED FOR THE PROTECTION OF MANUFACTURERS, MERCHANTS AND BUSINESSMEN. A BUREAU OF INFORMATION, GIVING FINANCIAL STANDING OF DEBTORS AND CUSTOMERS. Located at 109 Dearborn Street. Chicago, Ill.